Disclosure: This post contains affiliate links and some sponsored content. These links are through companies that I use in our homeschool and trust. If you would like more information on this, please see my disclosure policy. Thank you for your continued support to my site! Wednesday - This was our only Bible lesson this week, but it took us about an hour to complete. We used Grapevine Studies New Testament Levels 1, Level 1 Traceable and Level 2. (See my review on this amazing company here.) We did a timeline for Adam, Noah, Abraham, David, and Jesus. We also talked about Babylonian Captivity, John the Baptist preaching and how baptized his cousin, Jesus. We also discussed Jesus being tempted, the 12 apostles, and how Jesus prayed. Daddy even got to be one of the students! Tuesday - B did Lesson 63 on ABCmouse and was introduced to bar graphs. G did Lesson 19 called Math: Number 9 and More. Wednesday - Today we did lessons 1A and 1B in Math-U-See and learned about place value for hundreds, tens and ones. B was to taught their "Build, Write, Say" Method. G worked in his workbook on writing numbers 1-9 and doing dot-to-dot sheets. Monday - We were blessed with a copy of the movie, Woodlawn from a company called Fish Flix. I will be reviewing this soon so I don't want to go into too much detail about the movie, but the beginning shows footage of segregation. There is no sound or profanity as this is a Christian movie, but my sons asked what was going on and why were people being hurt. Today marked the end of February and Black History Month, so we explained to our sons that people who were African American used to get treated differently. We told them how wrong this was and that God created all of us equally, and we need to treat everyone fairly. We have friends at church and in the neighborhood who are African American, and I love the boys innocence in all of this. They don't see color, because they were taught not to. It shouldn't matter what a persons skin color is, but how they behave and act towards others and show the love of Christ. Ultimately, this is what this movie represented and they did a beautiful job! Wednesday - B's lesson in ABCmouse today covered the history of Dr. Martin Luther King, Jr. We learned that he grew up in Atlanta and went to seminary. He moved to Alabama when he married Coretta Scott and he became a pastor. It talked about how things were segregated, which means separated. African American people were not allowed to eat at many restaurants, go to white schools, pools or even bathrooms. It talked about Rosa Parks and how she refused to give up her seat on a bus. This led to many African Americans boycotting goods and it took a year for the message to get across. Laws were changed, and MLK Jr. won the Nobel Peace Prize. Monday - The boys and I worked on Magic School Bus Science Club today, and learned about magnets. We learned that they have a north and a south pole on each end, and how they need to be opposite to connect (or attract). They also learned that cows have magnets placed in one of their stomachs when they are young to attract any nails, wire, or metal they may eat while eating grass. We also learned that iron gives red blood cells oxygen and when there is not enough, you are considered anemic. It was interesting to learn about the poles on a magnet because we also learned about the poles on Earth, and how it revolves on its axis in Christian Kids Explore Earth & Space. Earth revolves around the Sun and the moon revolves around the Earth. We learned the structure of Earth (check out our Electives section below on what we did!) and completed the Unit 1 Wrap Up. B had to name the 7 continents, at least 2 oceans, and define revolve and rotate. Tuesday - B's lessons in ABCmouse today were on the digestive system and how food is broken down. We read in Midnight on the Moon about how there is no dust, rain or wind on the moon so if you leave a footprint, it will literally be there forever. There were discussions about the low gravity and lack of air on the moon, and how you weigh less on the moon. Thursday - Today, we read the February 2016 issue of Ranger Rick Jr. We learned about mountain hares, margay, caracal, fishing cat, sand cat, Bobcat, crowded leopards, servals, groundhogs, red winged blackbirds, and that a leap year happens once every 4 years. Monday - We read chapters 1-2 in Midnight on the Moon today. Tuesday - Today's chapters in Midnight on the Moon were 3-6. B also learned the Aesop's Fable of The Fox and the Stork today in ABCmouse, and G did Lesson 20 called Reading Mm-Nn. Wednesday - G did Lesson 18 in 100 Easy Lessons and he had to do some reading comprehension questions, as well as read the sentence, "Sam is mad at me." B worked on Lesson 26 in First Language Lessons where we discussed the proper and common nouns of cousins and their relationships to us. Lesson 27 had him read a poem called, "Hearts are Like Doors." We also read chapters 7-8 in Midnight on the Moon. Thursday - We did some readings and stories in Ranger Rick Jr and then finished Midnight on the Moon. Friday - B did lessons 28 and 29 in First Language Lessons, where we reviewed family relationships as common and proper nouns, our address and zip code. G worked on lesson 19 in 100 Easy Lessons and his words were at, that, ear, the, mitt, rid, ram, and the phonics of letter c. He had to answer some reading comprehension questions also. We ended the day by reading the book, Last Stop on Market Street. Wednesday - B wrote sun, spun, bun, hut, nut, shut, are, all, one, and his math numbers today. G wrote the letters m and a, and also numbers 1-9. Friday - B had to write the sentence, "My brother's name is" and our zip code; he also wrote he, go, me, so, we and no for his Spelling and Vocabulary words. Monday - The boys played outside with their friends today and had some Nerf battles. We also made a Play doh model of the structure of the Earth from the inner core, outer core, lower mantle, upper mantle and crest. We also had the boys pretend to be the Earth and the moon as they rotated and revolved around each other and my sunflower plant (representing the Sun) in the middle. All ideas from our science book, Christian Kids Explore Earth & Space. Tuesday - The boys listened to the song, "This Land is Your Land" on ABCmouse today, and they also played outside at Grandma's house. Wednesday - G did Lesson 21 on Art: Colors All Around in ABCmouse and the boys both had choir practice and Wednesday night children's group at church tonight. B also drew some pictures. Friday - G worked on some color matching his workbook today and learning how to spell the words and recognizing the colors of items. Looks like a really fun week! I love all your hands on activities for learning.We will be learning about the moon soon so I might have to pull out some oreos as well! We did a play-doh model of the earth last week too after watching a Bill Nye the Science guy on Earths Crust. 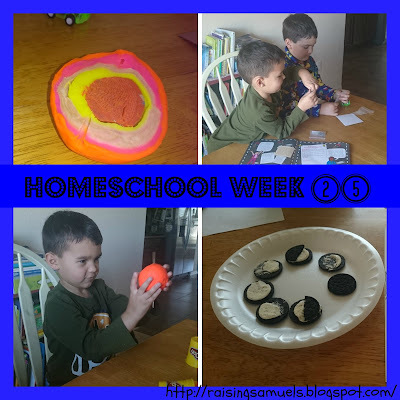 I love reading about your homeschool weeks! We did the Oreo/ moon phases activity too; it was so yummy! I like the idea of teaching about the layers of the Earth using play-doh; it would tie in so nicely with the class we just took on tectonic plates. I'm not entirely sure my boys know all the layers of the Earth. Loved both the phases of the moon & layers of the Earth ideas! Thanks for linking up at Family Joy Link Party! Loved so many of your ideas!! Hey Kelly I admire you for homeschooling your son, it is an amazing challenge that you have taken on to provide your son with education!!! Thank you for sharing in our #OMHGWW this week and for Co-Hosting with us this month!! I have pinned and Tweeted your post today!! Looks like a great week of learning and having fun. Thanks for linking up at Family Joy Link Up this week. Busy week!! My favorite is the earth models out of playdough... clever! I love that daddy is one of the students! :) Thank you for sharing with us on the Art of Home-Making Mondays! I've heard about ABC Mouse but never used it. It's great hearing about your experience with it! Thanks for sharing with our readers at the #LMMLinkup!